The Goodies was probably one of the most popular comedy series that spanned a little over a decade on British TV and starred the delightful Tim Brooke-Taylor as the upper class royalty lover Tim, Graeme Garden as the witty mad scientist Graeme and Bill Oddie, as everybody's favourite environmentalist hippy. The Goodies was a cross between Benny Hill meets the Looney Tunes and featured the comedic antics of three friends who were all about helping other people. 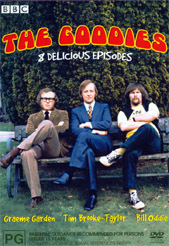 The Goodies - 8 Delicious Episodes DVD features eight classic episodes of the series that include the first ever "origin" episode and a variety of other amusing episodes such as "Kung Fu Kapers" and "Kitten King". The beauty behind the series of the Goodies was the dynamics between the three actors and how they played off between each others characters because none of them had anything in common. Much of the humour in the series is situational slap stick comedy with references taken from a variety of other movies such as Alfred Hitchcock, Three Stooges and even Grease. Although the current collection doesn't contain any of my favourite episodes, it does feature a wide breadth of "Goodies" humour from giant kittens to the deadly and ancient martial art from Lancashire called "Ecky-Thump", The Goodies - 8 Delicious Episodes is guaranteed to have something for every Goodies fan. The video quality of the disc is spectacular, considering that all the episodes have been digitally remastered to remove the damage from the original reels. The digital restoration feature should be watched first to appreciate the current quality of the video. The audio quality of the disc was unfortunately a little disappointing as there was quite a bit of background hiss. Fortunately, the audio commentary of the disc is perfect and truly showcases the quality of this series. I applaud the distributors of the Goodies DVD for the impressive extras that are included on the DVD. The extras range from cast commentary by the three actors themselves, an awesome digital restoration feature, storyboard and laughter free tracks, a small featurette entitled Surviving "Broaden Your Mind" footage and some hilarious outtakes. In conclusion, the Goodies - 8 Delicious Episodes is truly a blast from the past that really helped relive fond childhood memories of watching the goodies on the ABC at 6pm every night. From the catchy tunes sung by Bill Oddie, to the over the top character acting, The Goodies DVD is truly a disc that should be watched by all fans of the series.